This is the second of a two-part series where Sandra generously shares her wealth of experience on how to go about choosing a journal for penwork such as Zentangle. In the conclusion of this series, Sandra reviews 7 different brands of journals in detail. Lama Li makes a wide range of journals using the Lokta shrub, a renewable source that produces a variety of sturdy paper types. They can be hard to find and the paper varies considerably in each. But you can feel good about buying a ‘green’ choice; they’re attractive, and great to work in. I’ve used four varieties and fully intend to try them all. Lama Li Passport Journals are softcover and come in three sizes, 3.5″ x 5″, 3.5″ x 7″, 5.25″ x 8.25″, each with 40 pages. The thin paper is smooth and gives an excellent line. There is no bleed with permanent or water-based ink pens, but a shadow does show through if you hold the paper up to the light. The small size and price makes them a good choice for a beginner, who isn’t sure how much of a commitment they want to make, and they are compact and portable. Last year I filled up eight of these and gave them as Christmas gifts. The Lama Li Tibetan Flower Journals are hardcover, available in two sizes, 3″x4.5″ and 4.5″x8.5″, both with 50 pages. There is spring to the pages, but they will lie flat without much effort on your part. The paper is heavier than you find in most journals this size. Another great choice for beginners or travelers. The Lama Li Thick Journal has a hardcover. It comes in one size, 4″ x 6.25″, with 120 pages. The deckled edges and heavy grain make for an attractive paper. This is my favorite of all journals, but I don’t recommend it for everyone. The rough handmade texture requires you to respect the paper. The book doesn’t lie flat. If you are willing to put in the effort, your work will be rewarded, but this isn’t a beginner’s journal. The Lama Li Travel Journal comes in 2 sizes, 4.5″x7″, 7″x9″, both with 150 pages. It has a highly textured Lokta softcover with elastic band. The paper resembles newsprint, but is far sturdier. However, the bleed through is tremendous, so I can’t recommend this journal for everyone. I use mine for gel pen or pencil when I want to travel light but still have a larger size to work in. The Hand•book journal from Global Art Materials, Inc., has too many sizes to list, all with 128 pages. The hard covers are plain but elegant, with an elastic band. The paper is similar in quality, weight and feel, to the official Zentangle tile. You can get a crisp line, but you can also get wispy, smoky effects. This is a quality journal, and one you’ll be proud to have as a keepsake. They have recently come out with a watercolor version. The Moleskine is the journal of journals. It comes in both softcover and hardcover, and there is a version for almost any journaling experience you might want to have. Look for the word ‘sketch’ when buying one to use with pen. Moleskine Cahier [kaa yáy] Notebooks come in three softcover sizes, 3.5″ x 5.5″ –64 pages, 5″ x 8.25″–80 pages and 7.5″ x 9.75″–120 pages. The paper is smooth and thin but sturdy. A great choice for beginners or travelers. 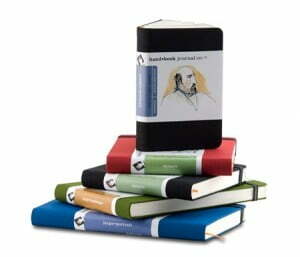 The hardcover Moleskine Pocket Sketch notebook comes in two sizes, the 3.5″ x 5.5″ –192 page, and the 5.25″ x 8.25″ –240 page. The cover is deceitfully plain with an elastic band. The paper is a joy to work on, a thin, off-white cardstock that gives you a clean, crisp line. There are millions (well, maybe hundreds) of Flickr, Yahoo and other groups devoted to Moleskine, so this is your journal if you are looking for an experience you can share. The Moleskine Japanese Album is awesome. Hard covered, it comes in two sizes, 3.5″ x 5.5″–60 pages and 5″ x 8.25″–48 pages. This is an accordion book, and you can stretch out the entire book into one long page. There are several groups who swap these journals. Each person illustrates 3-5 pages and then sends it on to the next artist until it comes back to the original owner. The paper is the same as you find in the sketchbook. You will need a stable surface, because the accordion structure is a bit awkward to work with. They’re a whole lot of fun, though. Laughing Elephant has a whole range of notebooks, but I’ve only used one. Laughing Elephant’s French Notebooks – This thin softcover comes in an 8.63″x6.38″ size with 20 pages. It’s a great choice for a beginner who wants to try paper with some tooth. The paper is good quality and sturdy, just inviting you to put your pen down and draw. Paperblanks has an incredible line of journals with mouth-watering silk covers in gorgeous prints, a variety of bindings and snaps and elastic bands. The paper varies by the type of journal, so look inside if you can. Be sure you buy a ‘Blank’ not a ‘Lined’, if you want this for drawing. Paperblanks Slim Journal is a hardback 3.75″ x 7″ with 176 pages. Be sure you get the ‘blank’ version. The paper is lovely to draw on, smooth with the faintest of grain. However, it is thin with a small amount of curl, and some bleed through. The beauty of the thing almost makes you forget that, though! Paperblanks Midi Round Corner Journal is a 4.75″ x 6.75″ hardcover with 176 pages, and a heavier, ultra-smooth paper. It’s a joy to use, from the string-bound binding, gorgeous covers and glossy paper. The Watermark Bindery journals are hardback, hand bound journals containing warm white 80# paper, with medium grain. These are not cheap, but they come from a small company in Washington that takes pride in producing a quality product. This is a journal you treat yourself to. Fabriano Quadrato Artist’s Journal – The softcover is a heavy cardstock that comes in 2 sizes, 6″x6″, 9″x9″, both with 96 pages. The awesome thing about this journal is that the paper comes in six light earth-tones: warm White, Hazel Brown, Ash, Felt Blue, Light Green and Ivory. The online information says it is excellent for writing ink, pencil, charcoal, and pastel. The paper is smooth but does have some grain. Overall, the journal is light in weight for its size. Sadly, a few pages have imperfections. I think they are impressions from something sitting on the page, so it could just be my journal in hand, and not something that would occur in all the journals. I haven’t had a chance to draw in it yet, but I know it’s going to be fabulous. If you missed Part 1 of this article, please visit this link. For easy future reference all of these journals have individual pages in the TIPS & TOOLS > PAPER, JOURNALS, SKETCHBOOKS section of TanglePatterns.com with illustrations and links to more information. Be sure to visit those pages. If you have experience to add about any of these journals, please comment on their specific pages. Thanks. Of course your comments of appreciation to Sandra for all her wonderful hard work are most welcome here. Great article about journals. I admit, I often drool over journals, but something about the permanence of the binding puts me off. I want to be able rearrange my pages, draw on a single piece of paper, etc. Any suggestions for practical, useful, portable, unique, beautiful, etc., ways to store and access completed Zentangle tiles? My favorite are the Primo Journals by Piccadilly. I prefer large and use the Red, blue, or Black. About 14.95 each. I only wish that they would make them also with plain paper. Part II of this article is equally informative. I truly appreciate your insight. I’ll be checking out some of these journals soon! Thanks, Sandra! This is really great information for those of us who’ve not had time or opportunity to check into all this. Thanks for all the information about journals. I have a lovely spiral-bound Sketchbook that is Archival-quality drawing paper and is acid free with 208 pages. I use the smaller one with pages that measure 7×10″. I love it because it lies flat and I can even fold it back upon itself. The ink has no bleed-through and the paper lends itself well to pencil shading. The pages are easy to remove if I want to and does not effect the overall construction of the book.I purchase it at Barnes and Nobel in the Art Book section. I have several visual journals of different sizes. 200g acid-free paper, spiral bound. Italian papers are my faves. They are gorgeous to draw on. The only negative is that I have not found a way to stick individual pages up on my wall without ripping them out of the journal. I enjoy scattering doodles around my walls…. but I do love creating visual journals.